Two sweet payphones standing directly next to the seated waiting around at Gate 15, and they're also opposite the public toilets here. You'll get noticed as the area is pretty quite with people just bored of waiting for their flight. Flights from here can be leaving for any part of the world but they do tend to be Lufthansa (the national airliner here). such a secure area. Two police officers even saw me and said nothing. You can see them behind a pillar in my panoramic shot here. Busyish area, alot of people passing by coming from and going to the public toilets that are off to the right of these payphones. Ok they aren't payphones... But they are call able telephones that are accessible by the public. They cool thing is that they do actually ring. This'll get the attention of anyone near to them. Even more so if anyone's looking at them. They are both iPhones, one is the 4G (left) the other is a 3G (right). 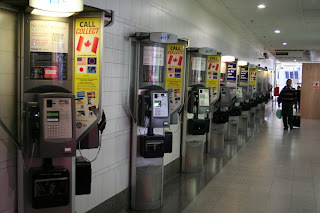 One day, I'll go back and list the numbers for each of these payphones. Would be awesome to just call them all at once. You'd stand a good chance of an answer, even just by calling one of them.